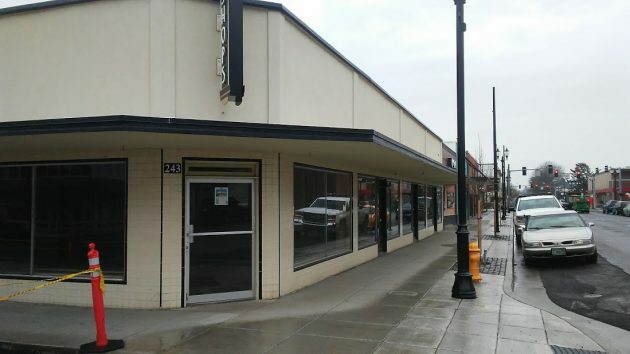 These attractive Albany storefronts at Third and Broadalbin have been vacant for a while. If this works, Albany may have fewer empty buildings and vacant storefronts in a couple of years. By “this,” I mean an agreement between the city council and Buxton, a firm that uses advanced analytic techniques to help cities attract business. The council heard a presentation from a young man representing Buxton on Jan. 8. Then, on Jan. 24, members voted to authorize City Manager Peter Troedsson to enter into a three-year agreement with the Forth Worth-based company. It will cost $55,000 the first year and $50,000 each the next two. If the council decides to bail out after the first or second year, there’s a cancellation fee of 20 percent of the remaining balance. The money will come from the city’s Pepsi settlement fund for economic development, recently replenished by more than a million dollars by the sale of three large city-owned tracts for subdivisions and a new grade school near Timber Ridge School. I don’t usually write about routine council actions, but then I remembered all the vacant stores around town, and all the unused commercial and industrial space. So perhaps this move on behalf of economic development is of more than passing interest. Assistant City Manager Jorge Salinas told the council in a memo that “Buxton is commonly known for developing data-driven strategies to assist communities in varied economic development initiatives.” And Albany is interested in, among other things, “understanding current retail and restaurant economic conditions” with the view toward retaining and expanding existing businesses and recruiting new ones. Do they have a no compete clause so they don’t contract doing the same thing with nearby cities? About time they did something. I just hope we get beautiful artistic stores in town. I have wondered many times why there are not shops and restaurants along the waterfront? Seems to me it would be a huge draw. Perhaps a small stylish hotel? I have made the same comments as Delfina in the past. I can only hope the people that do the studies of towns that need rejuvenation listen!!! Albany is trying but it seems to me more people need to support more businesses here. Especially in the downtown core. It could be really special! I love the idea of more shops and restaurants along the waterfront as well. What happened to the high paid consultant from Portland that drempt-up CARA. All this is more gov’t spending trying to re-establish the past—has not worked –witness vacant restored buildings. And the new money won’t work either. Shopping here is done away from downtown and we don’t shop local meaning downtown for many reasons. This concerns the whole town and has nothing to do with CARA, as I understand it. I bet if they fixed the streets it would attract a lot more business and customers to shop in those businesses. This effort and all other efforts all well and good. The desire to put Albany on the “map” isa valid one. To make Albany a destination. For that we need a big magnet and the magnet is the river. The desire to put Albany on the “map” is a valid one. Is it not ironic that the City Council’s choice for “Boosting Business” here involves doing business with one that isn’t here in Oregon? Oops – typo at the end of my comment (and no way to edit it). It should read “Redflex” (the Australian company with it’s U.S. operations based in Maricopa County, Arizona). I fondly recall a bakery downtown on first street not too long ago. This is a repeat of the concept of spending money to get Albany on the map–rejuvenate downtown = CARA which created many vacant restored store fronts. The mantra has been the carousel will do that—replace the trees–get new lampposts–get new sidewalks. Rays replacement is coming along because more homes in NA bring more customers and more new commercial construction is currently happening there. The Carousel had 75,000 visitors in three months from all over the country. There’s a lot of people giving their time and expertise to make this (all of downtown) successful. It’s easy to throw darts, it’s a lot harder to create. Tom, all you have to do is look at trying to find a parking place downtown today vs 20 yrs ago. Lots of good stuff is going on here and you have nothing to do with it. Re Waxhaw, NC – when was this done and what is the status now? New things often draw a lot of attention but soon fade and things return to what they were. Let’s face it, we are all locked into a pattern and we tend not to break those habits, i.e stores, restaurants, etc that we habitually visit. Has anyone been to downtown Corvallis? How do they manage to keep such a vital doentown. It can’t be just the college students. Blah blah blah… nobody can ever prove these New Age programs work or don’t, which is why they continue to prosper. Let free enterprise rule the marketplace and leave our public monies alone. For gosh sakes, it’s high time this town gets some conservative values going and uses some common sense! How many of you have traveled to eastern Oregon where the sun shines and the views are wide open? How many of you welcome the chance to see your Beavers or Ducks play the Broncos in Boise? It’s all about the scenery, the ability to see for miles and miles, the cleanliness, the newness of progress, and it’s all about good streets to drive on and to get around in a safe manner. We don’t need analytics to tell us these things, we just need to know how much! I just spent a year living near Boise, Idaho and the “breath of fresh air” feeling was wonderful. Mentioned here in earlier comments is our river. If you own a home here, you take care of your lawn and landscape don’t you? How come the river front doesn’t get any attention, both sides mind you? From city limit to city limit, prune the banks up, open the views, change our downtown look and stay on top of it! That’s what will attract businesses and customers to support them. The feeling of openess and sunlight is good for the soul, believe me! I’m glad so many folks give their time to carousel–keeps them happy. What economic benefit did Albany get from the quoted 75,000 visitors. Government’s record of creating is dismal. Private enterprise creates because they are creative. Bureaucrats are not creative types. Hasso, nice commentary. I wonder, though, about the “young man” description, as in a) how young (18, 25, 35, etc.) and b) what difference does it make how young or old the company rep was? Touche Brian Holman! And all of you who are on seeing the needs. Especially without paying someone to come in to broaden our horizon. And PLEASE PLEASE Lets start with getting rid of that terrible depressing looking wall mural!! !